Amanda Heyn creates a phenomenal list of 50 simple ideas to make your art program stand out and stick around for the Art of Education. 1. Ask your administrator to do a project alongside your students for a class period. 2. Create a mini gallery in the staff bathroom. 3. Ask the local grocery store to donate bags. Have students create art on the bags, then give them back to the grocery store to use. 4. Have everyone in the school participate in 15 minutes of silent doodling once a month on Friday afternoons. 5. Interview a student about his or her work and post it on your blog. 6. Highlight a “Student Artist of the Week” next to your classroom door. 7. Enter student work in a local or national art contest. Ask your community members to vote. 8. Add a sign to your hallway displays explaining any cross-curricular connections in the work. 9. Send an email to your staff highlighting a few pieces of student work each month. 10. Have students decorate gift wrap to use for community outreach programs during the holidays. 11. Hold an “Art-a-Thon” to raise money for a local charity. 12. Use QR Codes to create an interactive display for people visiting your school. 13. Keep bulletin boards and display cases full of interesting work. 14. Hold an art show. 15. Ask if you can hang art work in your District Office. 16. Ask if you can hang art work at local businesses or in government buildings. 17. Make a positive phone call home. 18. Participate in Back to School Night or Open House. 19. Volunteer to face paint at the school carnival. 20. Lead students in creating permanent (or temporary!) large-scale artwork around your school. 21. Complete a legacy project. 22. If your town has a gallery night, open your school and show off some student work. 23. Create an online gallery. 24. 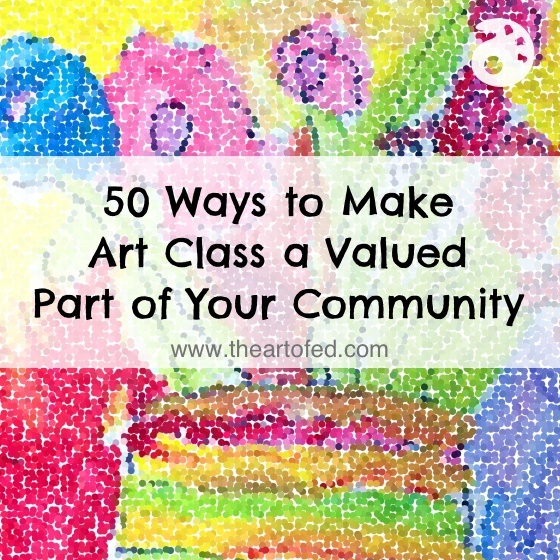 Use art as a fundraiser for your school. Share a portion of the proceeds with other teachers. 25. Have students create art for the school play. 26. Have students create art to hang at school concerts. 27. Collaborate with other teachers on some cross-curricular projects. 28. Create a monthly or quarterly newsletter for families. 29. Create a classroom Facebook, Twitter or Instagram account that parents can follow. 30. Have a sign outside of your door that indicates big concepts being taught in the art room. Change it up weekly or monthly. 31. As part of a reflection at the end of a grading period, have students write what they have learned in art class. Compile the results and share them with your staff. 32. Create a promotional video for your class. 34. Take students on a field trip. Ask parents and administrators to come along. 35. Have students write one new thing they learned on the back of a project to share with someone at home. 36. Create a list of guiding questions for parents and students to use when discussing artwork. 37. Ask about holding student-led conferences in the art room. 38. Make it easy for people to find your classroom website or blog. 39. Create signs to hang outside of classroom doors during conferences toremind parents to come and see you. 40. Ask your librarian to pull books for you. 41. Announce new hallway displays, upcoming art shows and art events on the loudspeaker. 42. Do a lesson with sidewalk chalk to beautify school grounds. 43. Make stepping stones for a school garden. 44. Hold a contest for students to design school t-shirts. Make them available for purchase. 45. Have your students write and illustrate a collaborative book. Give the library and each classroom a copy. 46. Make murals to brighten drab hallways. 47. Invite members of the school board to come spend a day in your room. 48. Send a piece of art through inter-office mail. 49. Create an art scavenger hunt throughout your school. Make clues available to classroom teachers. 50. Ask to put a piece of student art in a prominent place in the school office.